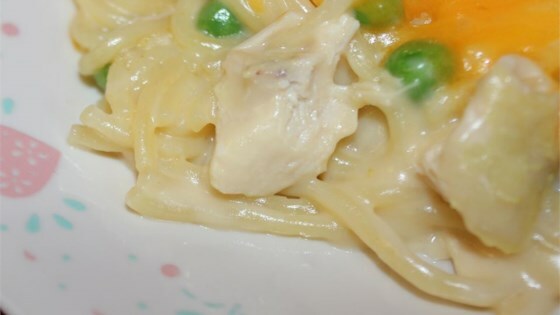 "A creamy comfort food casserole combining the flavors of chicken, spaghetti, mushrooms and cheese. Great for a rainy Sunday group gathering.8"
Bring a large pot of salted water to a boil. Add chicken and boil for 35 to 45 minutes, or until no longer pink inside. Remove chicken from pot, reserving chicken cooking broth in pot, and let cool before deboning. Remove chicken meat from bones and shred. Set aside. In pot with chicken broth, combine the celery, onion, parsley and spaghetti. Bring to a boil and cook 8 to 10 minutes or until spaghetti is al dente. Drain, reserving 1 cup of broth. Return drained noodles, celery, onion and parsley to pot. Add reserved chicken broth, shredded chicken, cream of mushroom soup and mushroom slices. Stir together, then evenly fold and spread mixture into a 9x13 inch baking dish and sprinkle with the cheese. Bake at 350 degrees F (175 degrees C) for 20 minutes, or until cheese is melted and bubbly. This was a good recipe but a little bland. I used fresh mushrooms but it also requires some garlic, herbs and/or seasonings to give it more 'oomph'. A good recipe to make your own. This was a great recipe, and it made so much, it fed my husband and I all week! I substituted the 8 oz of shredded cheddar for 16 oz of Velveeta, and it was great! Very econmical meal. Have made this several times - keeps well, freezes well and the guys love it. Great to make and reheat for work.